Our Abpromise guarantee covers the use of ab3801 in the following tested applications. The final fraction of enzyme contains a single polypeptide band of 11 kDa. This product can be used as part of an assay for sumoylation activity. Human Aos 1 + Uba 2 (ab3804), Ubc 9 (ab3803) and Sumo 1 (ab3801) can be used to promote in vitro sumoylation of a sumoylation marker (human Topoisomerase I protein fragment) (ab3828). The reaction products can be detected using our Sumo 1 (ab3819 and ab3824) and Topoisomerase I (ab3825) antibodies. Sumoylation assays are carried out in a final volume of 20µl in reaction conditions (20 mM Hepes pH 7.5, 5mM MgCl2, 2mM ATP). Sumoylation Protocol: 1. Prepare a suitable purified substrate protein. (For the control, use 2µl Topoisomerase I marker for each reaction). 2. In each reaction, add 4µl E2 to substrate first, then 2µl Sumo 1, 2µl 10x reaction buffer, 2µl E1. Finally, add H2O to bring up to 20µl. We would recommend adding fresh 2mM ATP to be sure that sufficient energy is supplied. 3. The best reaction concentration of proteins is as following: Aos 1 + Uba 2: 7.5µg/ml. Ubc 9: 50µg/ml. SUMO 1: 50µg/ml. For the control assay we recommend running the assay at 37ºC for 30-60 minutes. 4. Detect the reaction products by Western blot using a suitable antibody. For the control reaction use 1/1000 dilution of the supplied Topoisomerase I antibody. 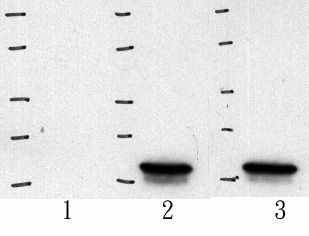 Four sumoylated bands should be seen on the gel for the control reaction. This assay has been shown to work with crude extracts. Be aware that Uba 2 contains his-rich regions which might cross-react with antibodies against the 6x-His epitope tag. During western analysis with anti-6x-His antibodies, Uba 2 at 80 kDa might be shown. Note: Topo I is S35-Met labeled. ab3801 has not yet been referenced specifically in any publications. Publishing research using ab3801? Please let us know so that we can cite the reference in this datasheet. I have a question about your product, SUMO-1 (Active) protein, used for in vitro SUMOyation assays. When it says "active", does this mean that it has been converted into the mature form and therefore, can be used in sumoylation processes? Because, physiologically, in order for SUMO-1 to bind to the target, it has to first become activated by a SENP member, and if we use the inactive form, it might not conjugate. So, the protein ab3801 is the mature, active form of SUMO1 and can be used in functional assays. I hope that this information will be useful, but if you have any further questions or if there is anything else that we can do for you, please let me know and I'll be happy to help.